This entry was posted on 06/08/2015 by hedgewick. It was filed under The Nth Doctor and was tagged with Divine Retribution, Divinity, Episodes, Mohana, Selene, The Master, Vortis. Marvellous. The Divinity are such a fascinating idea. Although, I do beg your pardon for my ignorance, but I was wondering if you could clarify something for me, do the Divinity somehow telepathically instill devout belief in those they meet or do they simply amplify pre existing belief? That’s a great question. It’s a bit of both, really. The Divinity possess a powerful psychic aura, one that conveys an impression of purity or glamour or authority. For this reason, their influence is strongest when they are close to their victims. At the same time, however, the Divinity tap into the pre-existing beliefs possessed by their victims. Those who look upon the Divinity see the embodiment of their faith, and they are woefully enthralled as a result. The Divinity are the central villains of our campaign. One of the great things about them is that they test the faith and resolve of all who face them. Even the Doctor’s closest friends and companions are at risk, and the Divinity have brought great conflict and turmoil to the TARDIS. I see, thank you for clarifying that. It’s truly a brilliant idea using religion as a weapon, I can’t wait to hear what these malevolent creatures have planned next. Nothing good I imagine. Thank you, John. It was a theme we were interested in exploring in the game. 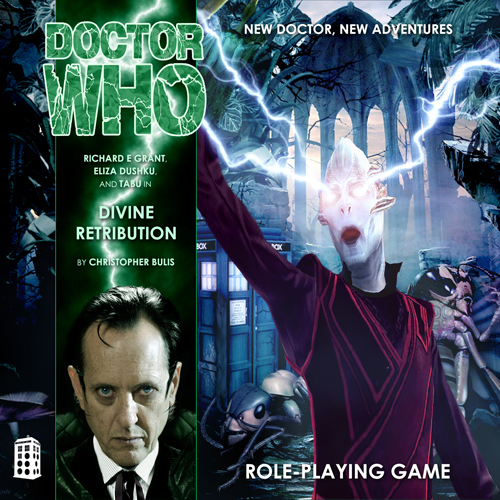 The Divinity’s use of religion as a weapon has certainly made the Doctor’s efforts more difficult, particularly his efforts to save the human race and protect human history. Keep an eye on the blog. The Divinity returned in our most recent adventure, “The Atlantean,” and things are ramping up for an epic season finale. We’ll be posting an update soon.